Prokaryotic cells come in many different shapes and sizes that you can see under a microscope. A description of the shape of a cell is called the cell morphology. The most common cell morphologies are cocci (spherical) and bacilli (rods). 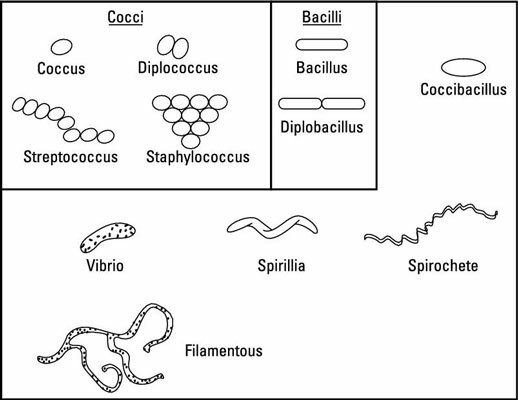 Coccibacillus are a mix of both, while vibrio are shaped like a comma, spirilla are shaped like a helix (a spiral, sort of like a stretched-out Slinky), and spirochetes are twisted like a screw. The illustration shows these common cell morphologies. Cocci bacteria that divide along a single plane form small chains of two cells called diplococci or long chains of multiple cells called streptococci. Cocci bacteria can also divide along multiple planes to form tetrads (two planes), cubelike sarcinae (three planes), or grapelike clusters called staphylococci (multiple planes). Similarly to the cocci, rod-shaped bacteria can divide to form double-celled diplobacilli or longer chains called streptobacilli. The shape of a cell is encoded in its genes. Although it’s known how cell shape is controlled, the reason behind the many different shapes remains a mystery. You may notice that some of the morphologies are also the names of bacteria — for example, Streptococcus pneumoniae, Staphylococcus aureus, Bacillus anthracis, and Vibrio cholerae. That’s because morphologies are sometimes characteristic of bacterial genera. Morphology is a descriptive characteristic — it doesn’t give you enough information to know exactly what type of bacteria you’re looking at or its function.